We had the big dinner a day early at my house. Currently, I’m boiling down the turkey bones for soup stock. Not to brag, but it smells fantastic in here. It’s giving me visions of the turkey pot pies, to come. I’m not going to wave my diet-finger and go reminding everyone to watch their portions and deserts (at this point, that would be totally hypocritical on my part). But, I will suggest you do yourself a huge favour and take a post-Thanksgiving dinner walk, rather than a post-Thanksgiving diner nap. Your digestive system will thank you for it. I hope you all are enjoying this bright and beautiful long weekend and have as much to be thankful for as I do! 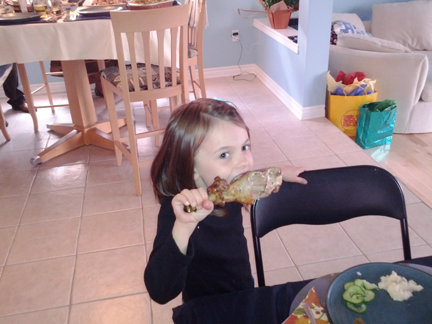 My niece, showing us how it’s done, drumstick style!